Dear Andrew, I must extend my heartiest wishes to you as I was searching for Dudley train station. I knew it was there at sometime and I thought I knew where it was but it was your photographs which confirmed its existence. I have been going thru some other material and am convinced that the station will re-open in 2011 as a Midland Metro station. I hope you would be happy to hear that as even I think it is good news. I would love to find out more about railways and I shall always remember your website. I see from the updates you missed Long Marston station, it was built on quite awhile ago. There is still a miniture railway around the building! It is the start of the Greenway footpath, from Long Marston to Stratford-upon-Avon. I must try it in the summer. Milcote Station is more worth a visit, as some of the down platform survives and the GWR conifers planted along it. Over the road is the 5344 cafe - well worth a visit - an ex BR mkII coach! website you have there in the south of. England and then I have just. indeed over in the north east of. 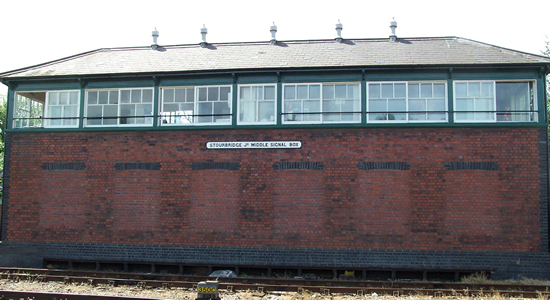 Nice site with some interesting information and images of trains and railway stations. I have added a link to your webpage on a travel community called trivago so other people can view your site. If you or any of your guests would like to add pictures and information about Birmingham or the West Midlands on trivago you are very welcome. Keep up the good work and I hope you complete youe quest. Googled old birmingham railways and came across this fascinating site. Dad was an railway man for 47 years so this brings back some memories of things I recall and things he told me about. Does anyone have any pictures or info on the goods yard that used to be at severn street? just browsing on google earth and came across your site. as an avid steam rail fan it\'s great to see a \"local history\" of any area, as you said, it\'s a shame that years ago we didn\'t have cameras to hand, but luckily some people did. a really interesting site and well laid out and of interest to any rail/history fan. One of the most fascinating features of Midlands' rail history is to my mind the aborted Duddeston viaduct (Misc section on this site - http://www.railaroundbirmingham.co.uk/full_photo_pages/brunels_viaduct_to_nowhere_montague_st.htm ). It's an amazing brick viaduct that still dominates the area - if on a train from Walsall/Lichfield approaching the Proof House junction at New Street, you can see the viaduct in the distance making its way towards you and stopping. Tracing it on Google Earth shows that it goes over half the way to the New Street line before stopping. It's amazing to think that no-one has been on the top of there in over a hundred years (dunno when it was built) - but I've only ever found limited information about the scheme. I wonder if these pics of Selly Oak would stir the memories of anyone with connections to the area? I do recall the Dares Drum Bitter ad that was on the bridge over the A38. Also a coal yard that I got down into and then onto the tow path of the canal. Had one of those early scooters and decided to follow the canal. Ended up in the Gas street area but had a great day on New St. All of 7 at the time.